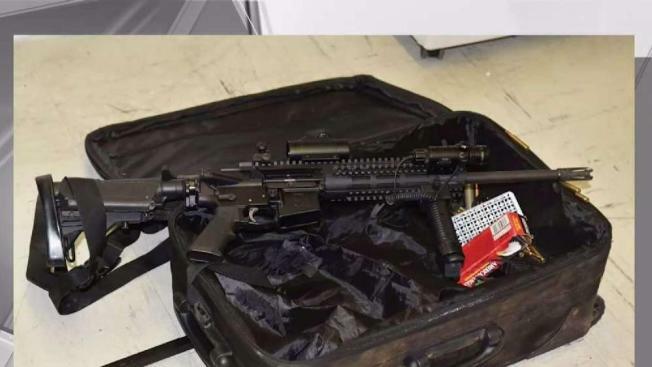 A loaded AR-15 was found in a suitcase being wheeled on the street in Brooklyn. Ray Villeda reports. A man threw a suitcase with an AR-15 sticking out of it at a police officer after the officer noticed him rolling it down the sidewalk in Brooklyn, prosecutors say. Two NYPD officers responding to a 911 call reporting a man with a gun near Halsey Street and Marcy Avenue in Bedford-Stuyvesant around 10:40 p.m. on March 1 saw Anthony Morgan rolling a suitcase down the sidewalk with a firearm “clearly protruding from the luggage,” according to a complaint filed in the U.S. District Court for the Eastern District of New York. When Morgan saw that police had seen the gun, he tried to pull it out of the suitcase and run away, but it got stuck, so he threw the suitcase at one of the officers and kept running, according to prosecutors. When the officers arrested Morgan, they found a loaded AR-15 with a bump stock attached to it inside the suitcase, along with ammo. Prosecutors said Morgan told police he was “jumped” and robbed at a party earlier that day. After the robbery, he went to a friend’s house, got the suitcase with the rifle and ammo, and was planning to return to the party when police spotted him. Morgan was previously convicted of second-degree attempted robbery back in 2001. His attorney information wasn’t immediately available Monday.